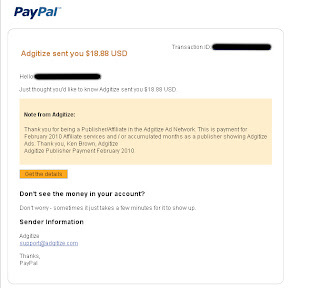 I received my second Adgitize payment last March 6th and thought I'd share the good news with you all. I run an ad for two of my sites last month and paid $28.00... I earned $18.88 of accumulated earnings so that means I only actually spent around $10.00 not to mention the traffic that it drove to my two blogs: Just About Anything and Samantha's Own. Below is a screenshot of my payment as testimony that this service does pay. I obscured the transaction ID and my real name for privacy purposes. Even if you are only a Publisher, you can still earn money by publishing content on your blog and clicking on ads on a regular basis. Remember that you need to make 100 ad clicks (you can do this by visiting other blogs and clicking on an Adgitize ad) if you are a publisher but only 50 ad clicks (please correct me if I am mistaken) if you are an advertiser. There is really nothing to lose in the wonderful world of Adgitize so if you are not yet one of us, then come join us! Get World Class Advertising on a Bloggers Budget today. I'm not as lucky, I only earned a few cents. That's because I'm not clicking Adgitize ads. I spend more time dropping Entrecards kasi. Congrats on your earnings! Naku, I have to devote time pala for clicking ads noh lalo na pag naging advertiser ako... hirap naman kase ng 100 clicks... hehehe... tapos nanglulumo ako sa earnings ko.. ni di manlang umaabot ng $1... hehehe... di ko pa talaga kabisado how adgitize works.. pero siguro sa banda banda dyan, I'll advertise na..thanks for sharing, mommy kamz! Wow congrats Kikamz. I got the DVD nga pala in the mail yesterday. kaso hindi ako naka blog kahapon nag luko ang pc namin. I just read your message at FB, blogged about the contest already and left a comment at phepots blog. I have question, 1 blog owner counted lang ba as one referral? Kasi kung bawat blog post counted as one referral, i could post this contest to my other blogs para manalo ka madame hehe. Thanks for this post, I agree with you. There are actually a lot of ways for an individual to earn extra bucks in the internet. Specially the writers, I think they have high demands here. Thanks for your suggestion. How will I do it?my blog kasiis not as influential as yours? hehehehehe.. will you help me? wow, buti ka pa na earn dyan ako ang tagal na hindi parin, wala yatang may gustong mag click sa ads ko, LOL. sis I am so happy for you!